Look Wrong in its eye? Trust in Our Common Future. The illustration at the top is called “Poesía visual para Rosa Parks” by Rodrigo Alvarez. Alvarez uses musical symbols in ironic fashion. His equation means: one white half note does not equal two black quarter notes. 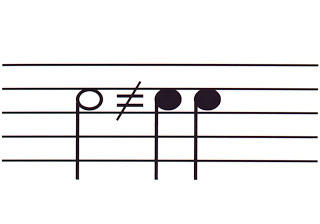 Yet in musical notation half notes are white, and they do equal two black quarter notes. Alvarez has created a confusing “non-equation” to draw attention to untenable notions of racial segregation and inequality.